What is a duck boot? An avid outdoorsman, Leon Leonwood Bean wanted to create a comfortable, dry pair of boots for tromping through the backwoods of Maine. The L.L. Bean signature boots are still sewn in Maine and have stood the test of time. They keep feet remarkably warm in chilly weather thanks to Thinsulate Insulation. The supportive steel shank and rubber chain-tread bottom provide comfort and traction. While many boots on the market might look similar to L.L.Bean Boots, they lack the attention to detail and the premium-quality materials that have allowed this footwear brand to stand the test of time. Thinsulate™ Insulation olefin/polyester in rubber bottom for extra warmth during cold snaps. Best of all, they are made in Maine, one pair at a time. These shoes are used as hunting shoes because they are comfortable to walk on snow and water. 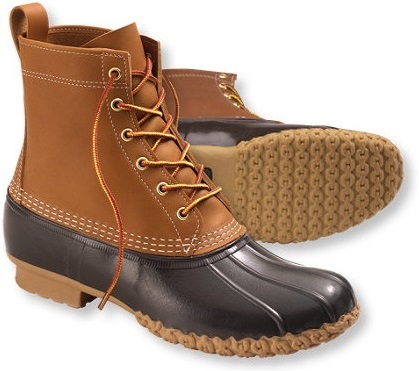 This shoe was first invented in 1912 by Leonwood Bean (L.L Bean). The Duck Boot was originally referred to as the L.L. Bean Boot. The company L.L.Bean was founded in 1912 by its namesake, avid hunter and fisherman Leon Leonwood Bean in Freeport, Maine. The company began as a one-room operation selling a single product, the Maine Hunting Shoe (aka L.L.Bean Boot). Bean had developed a waterproof boot (a combination of lightweight leather uppers and rubber bottoms) that he sold to hunters. He obtained a list of nonresident Maine hunting license holders, prepared a descriptive mail order circular, set up a shop in his brother's basement in Freeport, Maine, and started a nationwide mail order business. By 1912, he was selling the "Bean Boot", or Maine Hunting Shoe, through a four-page mail-order catalog, and the boot remains a staple of the company's outdoor image. In addition to the original purpose of walking in wet conditions, the duck boot has also become successful simply for its style and appearance. The duck boot has gone in and out of fashion similar to many other styles of fashion footwear. Learn more about the duck boot options at L.L. Bean or other fine footwear retailers. We are not certain how L.L. Bean first designed the boots, but some companies make the boots with the upper section of the shoes produced using water repellant fabric called duck cloth canvass and the bottom of the shoes made with a rubber sole. The boots are intended for the rainy season or if you live in an area with a good amount of water like a duck may. Cotton duck (from Dutch: doek, "linen canvas"), also simply duck, sometimes duck cloth or duck canvas, is a heavy, plain woven cotton fabric. Duck canvas differs from plain canvas in that the threads in the former are more tightly woven. There is also linen duck, which is less often used. Cotton duck is used in a wide range of applications, from sneakers to painting canvases to tents to sandbags. Duck fabric is woven with two yarns together in the warp and a single yarn in the weft. Find duck fabric mills here on Apparel Search. Learn more about fabric in our fabric definitions section. Thank you for taking the time to read our footwear industry blog post. We hope that you have found this news to be informative. If you have comments or questions, please add your thoughts in the discussion area below.